Original Editor - Sarah Dorsey, Maria Tyumkin, Megan Willerth, Jennifer Withers, Logan Wood. Calcifications are hypothesized to be due to lipid deposition and demyelination. The presentation of an individual with Fahr’s disease can vary greatly with some remaining asymptomatic despite receiving imaging confirmation of calcification. In more severe cases individuals will present first and most prominently with extrapyramidal symptoms. Further symptoms may include: progressive psychosis, cognitive impairment, dementia, gait disturbance and sensory changes. Fahr’s syndrome can present at any age, but is typically first diagnosed in individuals between 40-60 years old. Fahr's syndrome is familial and inherited, with autosomal dominant cases making up 60% of diagnoses. Some research has shown that fewer cases may be inherited in an autosomal recessive fashion. There are also several other factors that could lead to brain calcification which include: endocrinopathies, vasculitis, mitochondrial disorders, infections, other inherited disorders, radiation, chemotherapy and carbon monoxide poisoning. Prognosis differs from person to person and thus is hard to predict. Fahr’s syndrome is a progressive disease with no known cure and no specific treatments at this time. Due to Fahr’s progressive and degenerative features individuals will often lose previously acquired skills and motor control, which can lead to death. There is no direct correlation between the amount of calcium deposits that are seen in the brain and the degree of neurological impairments displayed by an individual with the disease. 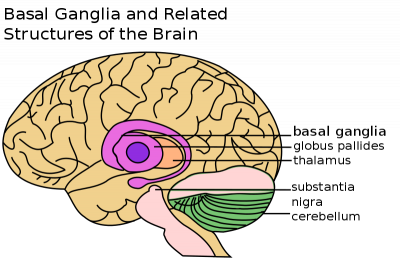 Lesions in the basal ganglia can cause patients to present with different motor deficits. These include slowness of movement, involuntary extra movement and alterations in posture and muscle tone. Therefore patients with basal ganglia involvement can present on a continuum of motor behaviour from severely limited as seen in the final stages of Parkinson’s disease to excessive movements apparent in Huntington’s disease. In “Fahr’s Disease Registry”, the most common symptoms were movement disorders, in particular parkinsonism, which affects more than half of patients. Dystonia A movement disorder that causes sustained muscle contractions, abnormal postures and repetitive twisting movements that can vary in speed. Dystonia can affect one or several regions of the body. There is presently no cure for dystonia, but the goal is to help decrease the severity of muscle spasms, pain and awkward postures to improve overall quality of life. Athetosis A movement disorder characterised by slow, smooth, sinuous, writhing movements, also described as “wormlike movements”. More common in the distal upper extremities, but also prevalent in other areas of the body such as face, trunk, neck and tongue. Pure Athetosis is uncommon as it usually presents with a combination of spasticity, tonic spasms or chorea. Chorea Abnormal movement involving involuntary, irregular, purposeless, non-rhythmic, abrupt, rapid and unsustained, that can flow from one area of the body to another. These movements can vary in amplitude, small movements of the fingers to flailing of limb movements, referred to as ballism. Patients are at an increased falls risk due to impairments in balance, strength and increased fatigue. Musculoskeletal and respiratory changes can result in physical deconditioning and contribute to decreased participation in daily activities and social participation. Spasticity A motor disorder characterized by a velocity dependent increase in muscle tone with increased resistance to stretch, the larger and quicker the stretch, the stronger the resistance of the spastic muscle. During the rapid movement, a sudden inhibition or letting go of the limb termed the “clasp knife” response may follow initial high resistance. Chronic spasticity is associated with contracture, abnormal posturing and deformity, muscle weakness, functional limitations and disability. Tremor Involuntary shaking movements. Tremor can be seen in the extremities, usually as a resting tremor the presents when a patient is at rest, or in the head and trunk, when the patient is trying to hold an upright posture. A resting tremor can eventually progress to an action tremor, which is tremor with movement. Although the pathophysiology is slightly different from Fahr's, Parkinson’s patients tend to exhibit a mild tremor first on only one side of the body; there is not enough data to decisively say if this it true for Fahr’s patients. Tremors tend to worsen with stress, anxiety or an excited emotional state. Particularly in later stages, tremors interfere with the ability to perform functional activities, especially fine motor tasks such as picking up or holding objects. Rigidity Increased resistance to passive movement that is not affected by speed or amplitude of motion. There are two types: lead pipe - which is constant throughout range - and cogwheel - which is jerky with tension felt intermittently throughout a movement. Rigidity affects a patient’s ability to move and therefore independently carry out activities of daily living (ADLs). In many patients, rigidity can be increased by stress or active movements. Hypomimia The reduced ability to portray facial expressions, both automatic and voluntary, that is often seen in Parksinon’s and Fahr’s patients. This frozen, masked expression is often incorrectly interpreted by others as depression, coldness, apathy and reduced cognition. This can cause difficulty in communication and relationships, including patient-therapist relationships; studies have shown that practitioners - including physiotherapists - tend to view patients with facial masking as more depressed, less sociable and less cognitively competent. Therefore it is an important component of the treatment of Fahr’s disease to not allow oneself to form negative preconceptions about a client based on a symptom they cannot control. Gait Affected by Fahr’s disease similarly to Parkinson’s disease. Fahr’s patients can exhibit unsteadiness, clumsiness, a shuffling gait, or freezing of gait. Hypokinesia, which is a generalized slowness of movement, can also manifest in gait as an increased time to initiate and execute movement as well as decreased force generation. Hypokinesia A generalized slowness of movement. It can also manifest in gait as an increased time to initiate and execute movement as well as decreased force generation. Due to the heterogeneity of brain calcifications and associated impairments, it is common to see a wide variety of symptoms other than movement disorders. These include epileptic seizures, dysarthria, mood disorders, problems with cognition (memory and concentration), behaviour/personality changes, psychosis and dementia. While some of these symptoms may not be directly treatable with physiotherapy interventions, they do affect considerations for treatment and are important to keep in mind when planning for patient care. Included below are links to resources within Physiopedia and external sources that provide more information regarding these symptoms. There is no cure or standard treatment plan for Fahr’s syndrome. Symptoms and disease presentation are treated on an individual basis. Pharmacologic treatment can be helping in alleviating seizures, headaches and some psychiatric symptoms. There are no known studies on whether dementia medications are helpful in treating associated symptoms in Fahr's Syndrome. Parkinson-like symptoms are generally non-responsive to Levodopa. Due to the lack of literature on Fahr’s disease and the similarity of symptoms with Parkinson’s, Huntington’s and other neurological conditions, therapists should use their clinical judgement in combination with evidence about the treatment of the overlapping symptoms in similar populations. Recommendations for treatment include a focus on function, participation and exercise capacity, as well as preventing or slowing the progression of secondary impairments such as muscle weakness. Range of motion exercises, passive stretching and facilitated stretching can help maintain tissue extensibility and physical functioning. These exercises should ideally be done 5-7 days per week, but at least 2-3 days, with 3-4 reps of at least 15-60 seconds per stretch. Stretching can be combined with joint mobilization. Note for patients with spasticity, therapist should use constant pressure over bony prominences and avoid direct pressure on spastic muscles. Limb movement out of spastic position should be slow, repeated motions. Serial casts may be used for patients at risk of contractures and deformity. A general conditioning program is beneficial for most patients with neurological disorders to maintain strength and function. Include the principles of overload, specificity, cross training and reversibility in designing a program. Note with specificity, it is best to attempt to create exercises that will carry over into the client’s daily life, for example following an isometric protocol will not guarantee effects carry over to improved dynamic performance which is more applicable to ADLs. Muscles that commonly become weak in neurological populations include antigravity extensor muscles. Exercise machines, in contrast to free weights, may be safer for patients with more progressed motor symptoms since movements are more controlled. For patients with basal ganglia dysfunction, auditory cueing may assist with step timing, for example counting, stepping to a metronome or music. In particular, common strategies to improve Parkinsonian symptoms such as the regularity of gait and gait freezing, include visual cues like lasers attached to a walker or cane. Individual studies have also shown that participation in other activities, such as dance and high-speed cycling, can potentially improve gait. Relaxation techniques, such as deep breathing, are beneficial because patients with neurological conditions such as Fahr’s disease tend to experience a lot of stress and anxiety. Relaxation has documented benefits including elevated energy levels and a greater perception of control. For hyperkinetic disorders, deep brain stimulation. Which involves a surgically implanted device that sends electrical impulses to the brain to help control movement. Soft tissue release is beneficial for patients experiencing dystonia and spasticity. Case studies have also shown benefits of massage for Parkinson’s symptoms, including gait, range of motion, pain and upper limb function. There is some evidence that whole body vibration (WBV) may improve gait, tremor, rigidity, proprioception and balance in patients with neurological diseases, including Parkinson’s. However, systematic reviews have concluded that more high-quality research is needed. ↑ 2.0 2.1 2.2 2.3 National Institute of Neurological Disorder and Stroke. Fahr’s Syndrome Information Page. https://www.ninds.nih.gov/disorders/all-disorders/fahrs-syndrome-information-page (accessed 7 May, 2018). ↑ 4.0 4.1 Murat Gülsün M, Baykız AF, Kabataş S, Belli B. Fahr’s Syndrome Three cases presenting with psychiatric signs. EJGM 2006;3(1):35-40. http://www.bioline.org.br/pdf?gm06008 (accessed 7 May, 2018). ↑ 5.0 5.1 5.2 5.3 5.4 5.5 5.6 5.7 5.8 Shafaq S, Aslam HM, Anwar M, Anwar S, Saleem M, Saleem A and Rehmani MAK. Fahr’s syndrome: literature review of current evidence. ORJD 2013;8-156. https://ojrd.biomedcentral.com/articles/10.1186/1750-1172-8-156 (accessed 7 May, 2018). ↑ 6.0 6.1 Goyal D, Khan M, Qureshi B, Mier C, Lippmann S. Would you recognize Fahr’s Disease if you saw it? ICN 2014;11(1-2):26-28. https://www.ncbi.nlm.nih.gov/pmc/articles/PMC3960784/ (accessed 7 May, 2018). ↑ 7.00 7.01 7.02 7.03 7.04 7.05 7.06 7.07 7.08 7.09 7.10 Radiopaedia. Fahr’s Syndrome. 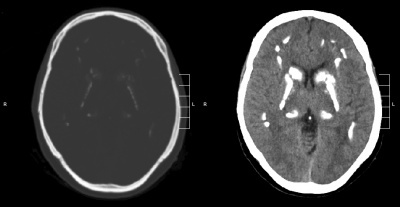 https://radiopaedia.org/articles/fahr-syndrome-1 (accessed 7 May, 2018). ↑ Fahr Too Strong Foundation. Commonly asked questions about Fahr’s Disease. http://www.fahrtoostrong.org/FAQ/ (accessed 7 May, 2018). ↑ 9.0 9.1 Kandel, ER, Schwartz, JH, and Jessell. Principles of neural science. 4th ed. New York: McGraw-Hill; 2000. p 853. ↑ Bressman SB. Dystonia genotypes, phenotypes, and classification. Adv in Neurol. 2004;94,101-107. https://www.ncbi.nlm.nih.gov/pubmed/14509661 (accessed 1 May 2018). ↑ The Dystonia Society. Generalized dystonia. https://www.dystonia.org.uk/generalised-dystonia (accessed 1 May 2018). ↑ Johnson RK, Goran MI, Ferrara MS, Poehlman ET. Athetosis increases resting metabolic rate in adults with cerebral palsy. Journal of the American Dietetic Association. 1996 Feb 1;96(2):145-8. ↑ Haines DE, Ard MD. Fundamental neuroscience: for basic and clinical applications. 3rd ed. Philadelphia: Churchill Livingstone Elsevier; 2006. p413. ↑ Fahn S, Jankovic J, Hallett M. Clinical overview and phenomenology of movement disorders. Principles and practice of movement disorders. 2nd ed. Philadelphia: Elsevier Saunders; 2011:P1-35. ↑ 17.0 17.1 17.2 European Huntington’s Disease Network. 2013. Physiotherapy clinical guidelines for Huntington’s disease. https://www.huntingtonsociety.ca/wp-content/uploads/2013/10/EHDN-Physio-Guide1.pdf (accessed 3 May 2018). ↑ O’Dwyer NJ, Ada L, Neilson PD. Spasticity and muscle contracture following stroke. Brain 1996;119:1737-1749. https://pdfs.semanticscholar.org/df70/aa84ee19dc6daed946a1de2d8ff26ed744fd.pdf (accessed 1 May 2018). ↑ 19.0 19.1 19.2 19.3 19.4 19.5 19.6 19.7 19.8 19.9 Bilney B, Morris ME, Denisenko S. Physiotherapy for people with movement disorders arising from basal ganglia dysfunction. N Z J Physiother 2013;31(2),94-100. https://pdfs.semanticscholar.org/be52/87e4d93e8576b28fde1ab44b23217bac279d.pdf (accessed 5 May 2018). ↑ 25.0 25.1 25.2 25.3 25.4 25.5 25.6 25.7 O’Sullivan SB, Schmitz TJ, Fulk GD. Physical rehabilitation. 6th ed. Philadelphia: F.A. Davis Company, 2014. Chapter 10. ↑ 26.0 26.1 26.2 26.3 26.4 26.5 26.6 26.7 26.8 O’Sullivan SB, Schmitz TJ, Fulk GD. Physical rehabilitation. 6th ed. Philadelphia: F.A. Davis Company, 2014. Chapter 18. ↑ Chaudhuri KR, Ondo WG, Logishetty K, Reddy P, Sherman R. Movement disorders in clinical practice. 1st ed. London: Springer; 2010. p49-65. ↑ Perrault E. 2010. The effectiveness of muscle energy and massage therapy for the management of symptoms related to chronic cervical dystonia. https://casere3.dspacedirect.org/handle/11106/26 (accessed 3 May 2018). ↑ Bavikatte G, Gaber T. Approach to spasticity in General practice. Brit J of Med Pract 2009;2:29. http://www.bjmp.org/files/sept2009/bjmp0909bavikatte.pdf (accessed 5 May 2018).